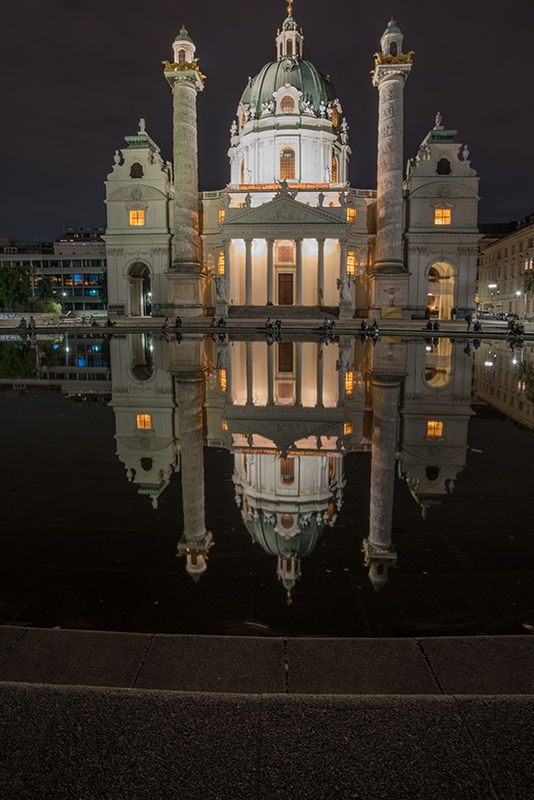 We traveled from Prague to Vienna by a private driver. 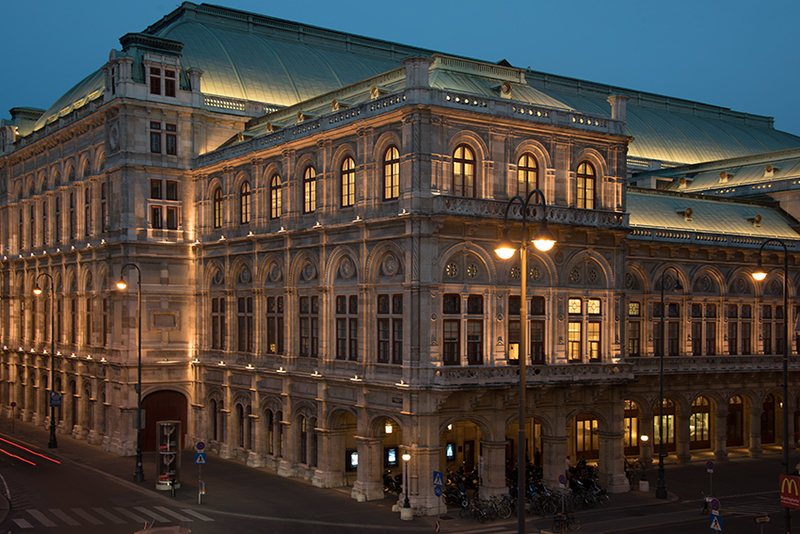 We had a beautiful apartment located about a block and a half from the Vienna Opera House. 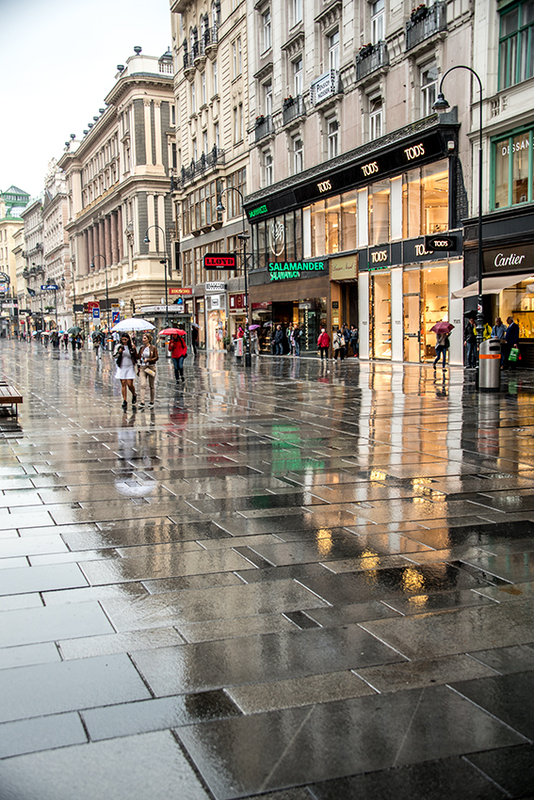 Most of the historic centre is located within Vienna's Ringstrasse - a ring road. The numerous monumental buildings were built during the 1860s to 1890s. 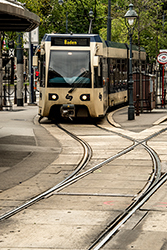 The Trams connect up to locations that may be outside the Ringstrasse, so it is a relatively easily city to get around. 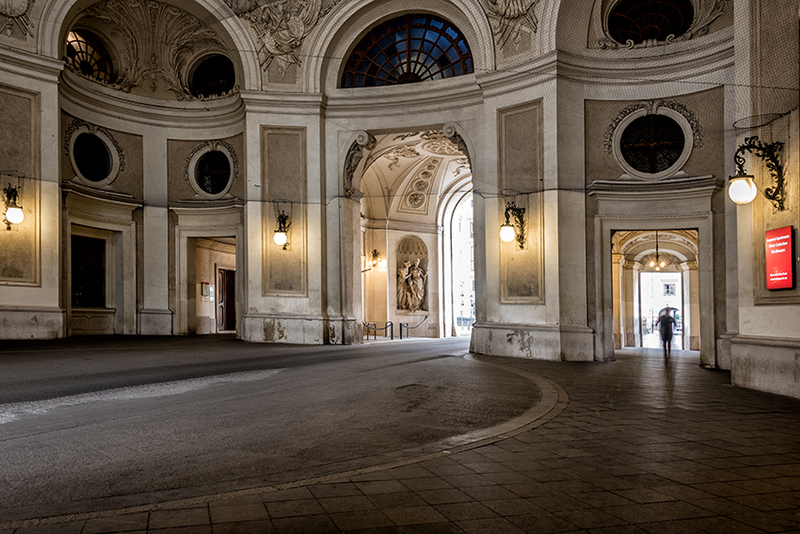 The Imperial Palace - Hofburg was just a few blocks from our apartment. It was a location for morning and evening walks. We also went through to see the Imperial Apartments, but I must question is I have to go through and see any more "imperial apartments" in palaces we visit. This is a historic centre and it was from this Palace the great empire of the Hadburgs was ruled. 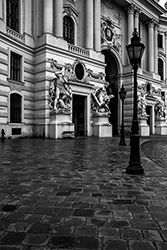 Today, the Imperial Palace houses the office of the President of Austria as well as an important congress center and numerous art collections. 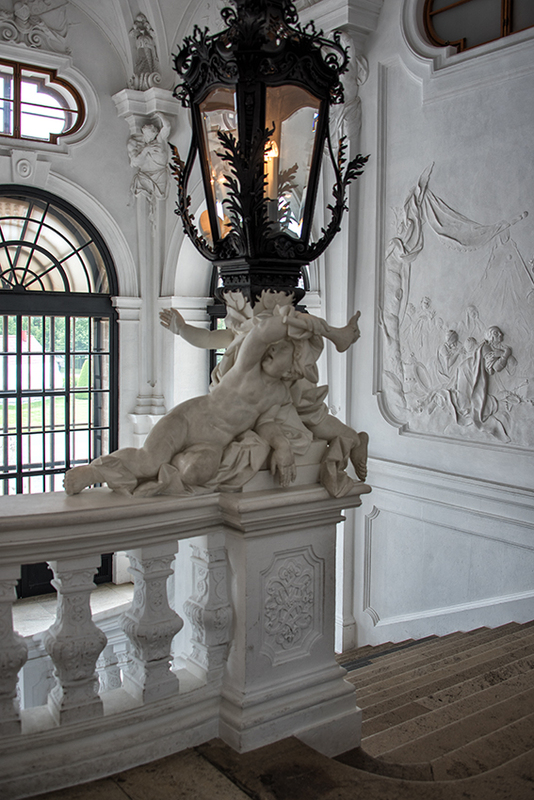 We traveled our on the tram to visit Belvedere, a palace built by Prince Eugene of Savoy (1663-1736) as his summer residence. 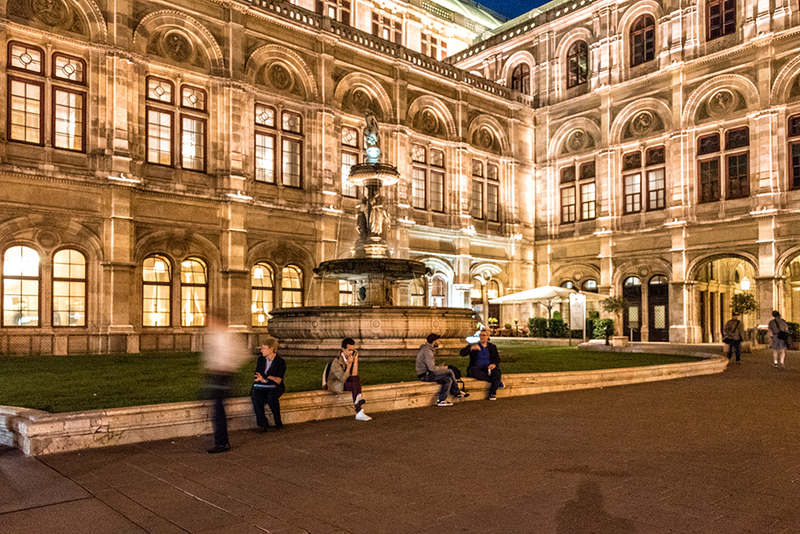 This palace holds the largest collection-of Klimt art. It was interesting. We saw the piece of art, Portrait of Adele Bloch. The 2015 move, Woman in Gold, was the story of Maria Altmann, a real-life Jewish refugee whose family's art was stolen by Nazis in World Wart II. 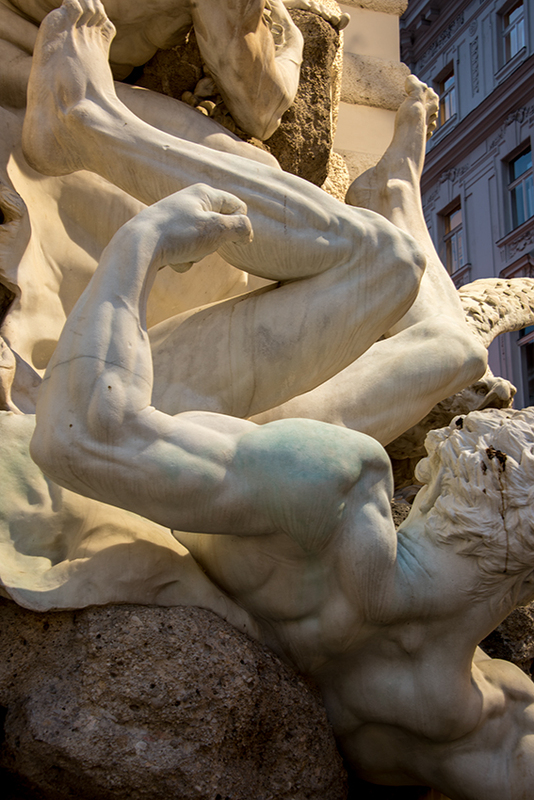 This piece of art is the centre of the story. 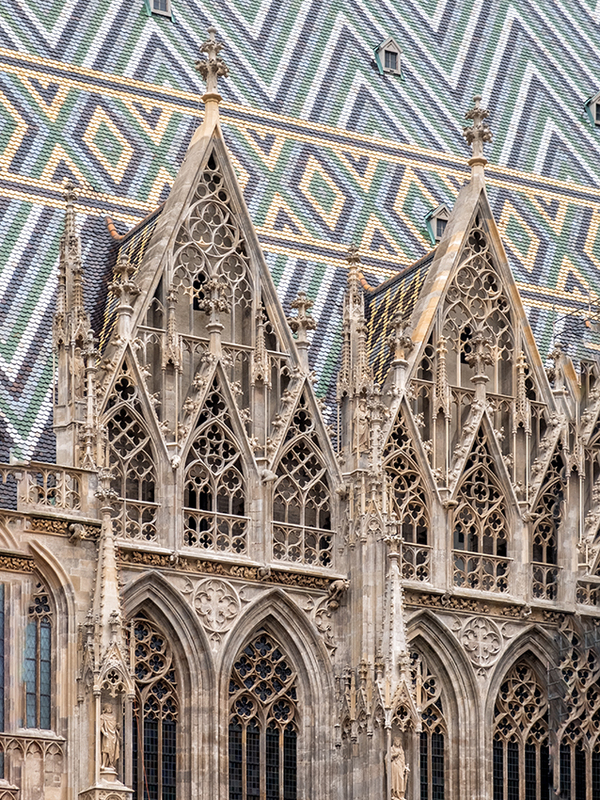 St. Stephen's Cathedral is considered the symbol of Vienna and dates back to the 12th Century. It was located down one of the pedestrian streets. A massive church although we all noted that none of the churches are a richly decorated as the churches we visited in Spain. 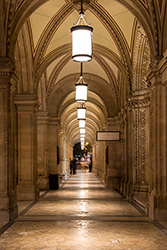 When in Paris, I really enjoy finding and walked through the various passages, the covered shopping walkways that run from one block to another. 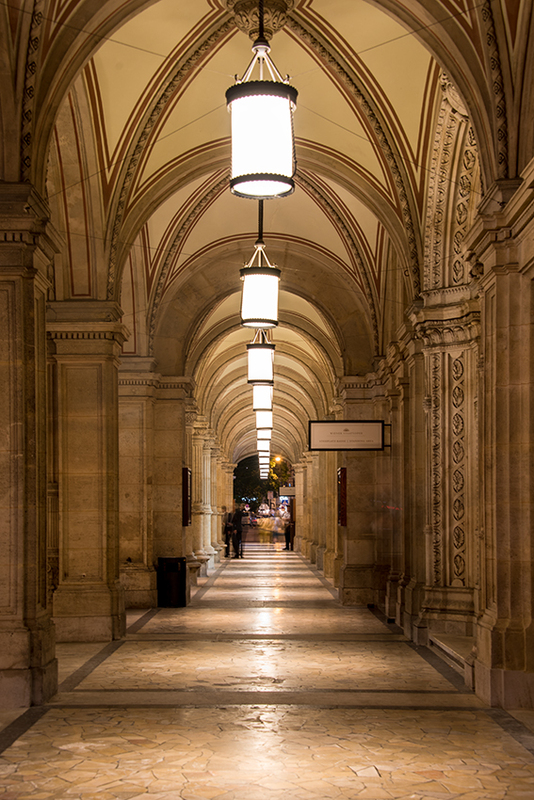 In Vienna I stumbled across the Ferstel Passage which is a stunning passage. The Grand Cafe was in one of the adjacent buildings and having coffee in their was very pleasant indeed. If you are going to the Grande Cafe, go early in the morning and avoid the line-up of tourists that form later in the day. 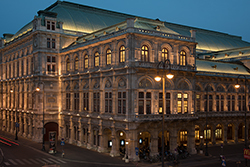 We enjoyed our time in Vienna, lots of grand sites to see, and the city is most impressive at night when the grand buildings were lit. Click the thumbnail to see large image and the image presentation. 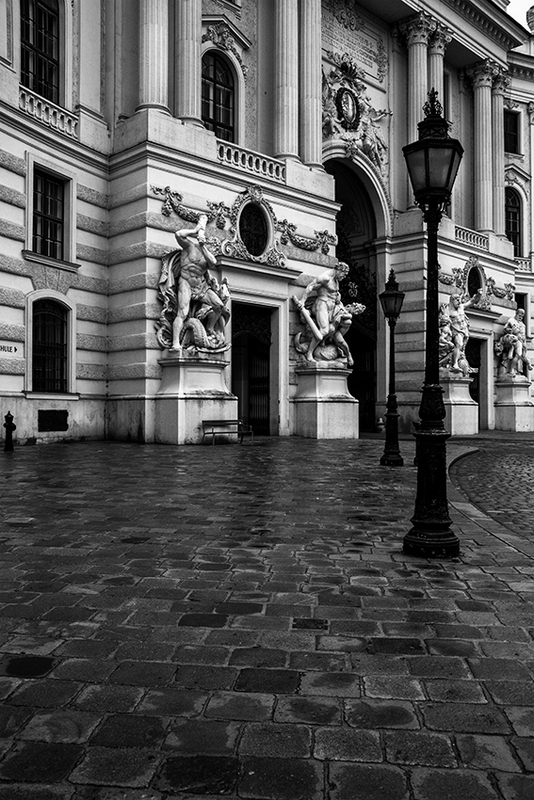 Hofburg is the formal imperial palace, built in the 13th Century. It is a large complex with various wings. One of the grand passageways through the Hofburg Palace. 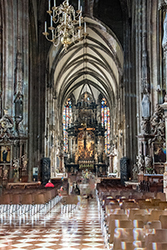 St. Stephen's Cathedral that dates back to 1160, with major reconstruction that lasted until 1511. 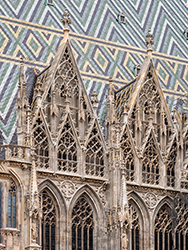 For our visit to Vienna, there was considerable construction going on around the cathedral but I think the photo of the side windows provides a feeling of the size of the building. Our apartment was just off one of the main pedestrian streets that run through the centre of Vienna. It really does m make a city comfortable when cars are not allowed the clog up the main streets! 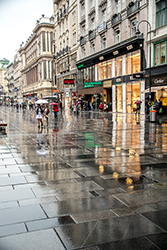 A little rain this morning, but we have convinced ourselves that rain is good, as it creates great reflections on the pavement. 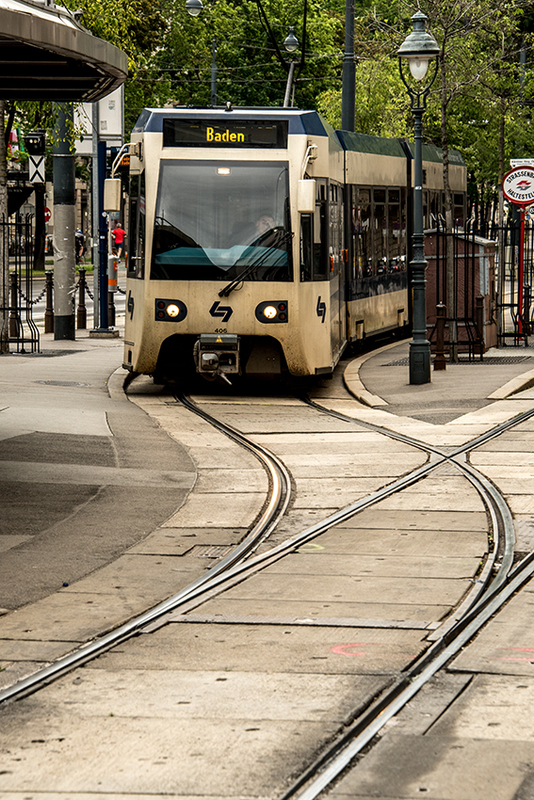 Vienna has a very good network of trams making it an easy city to get around. 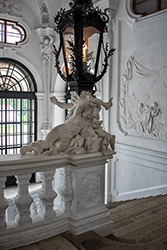 Grandeur of the Belvedere Palace as a summer residence for the Prince Eugeve of Savoy. 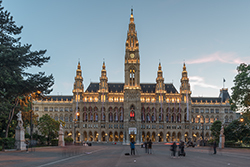 Rathaus is the city hall of Vienna. It was built between 1872 and 1882 and is an extremely impressive building. 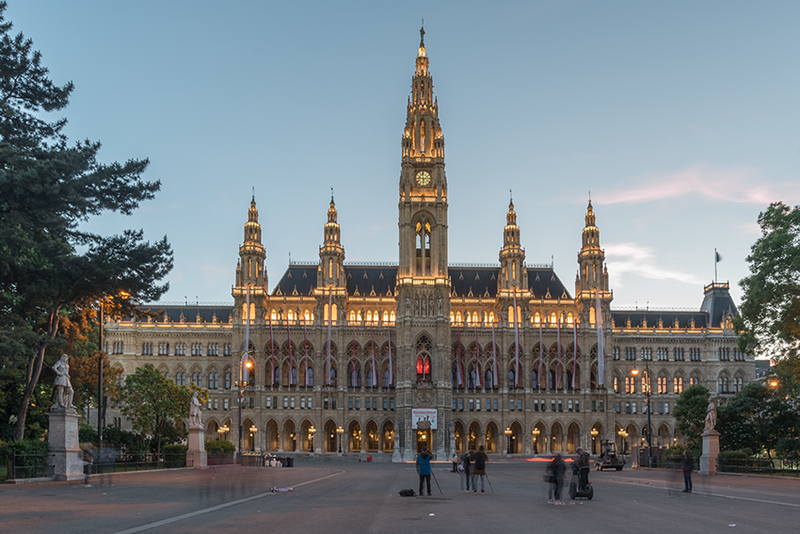 I travelled out to Rathaus with the goal of getting the building lit up, but, at the time of year we were in Vienna, lights are not coming on until 9:45 pm and this evening, the entire building was never lit up. But, the lights that were on outlined the key architecture of the building. 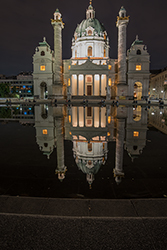 Karlshirche Church, 1716, is located on the south side of Karlsplatz. The two columns are modelled after Trajan’s Column in Rome. People were sitting around the pond and enjoying the evenings and the scene. 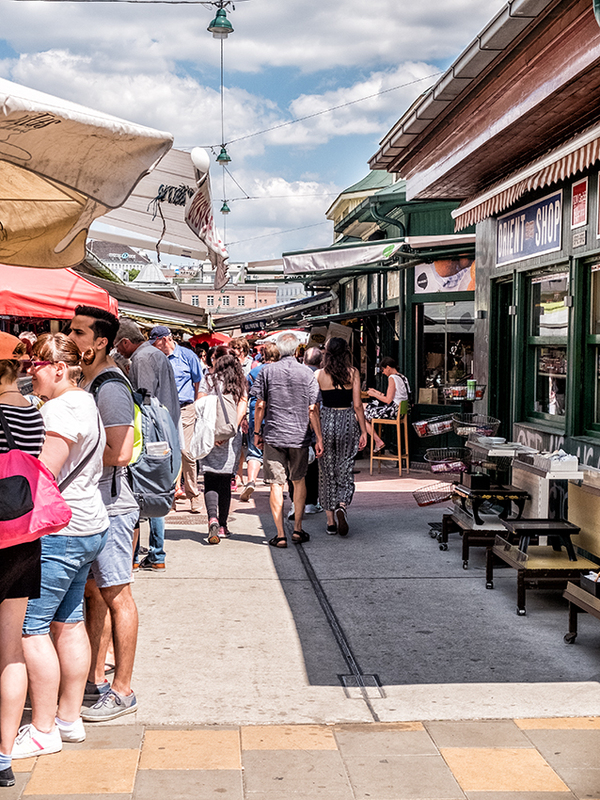 The Naschmarkt is the most popular market in Vienna. It stretches for mover 1.5 km and has been in operation since the 16th century. On Saturdays a flea market attaches itself to the regular market. The atmosphere of the Naschmarkt is famous far beyond the borders of Vienna, and large numbers of tourists visit the market every year. We spent the better part of the afternoon at the market along the stalls and then enjoying a great lunch at one of many restaurants. When our time to leave came, we again traveled by private driver towards Budapest. 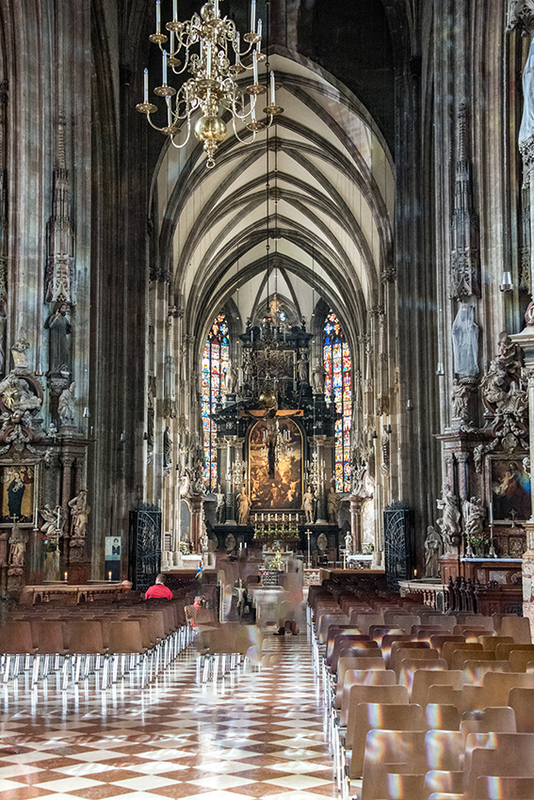 We would stop at Bratislava and the Pannonhalma Arachabbey.